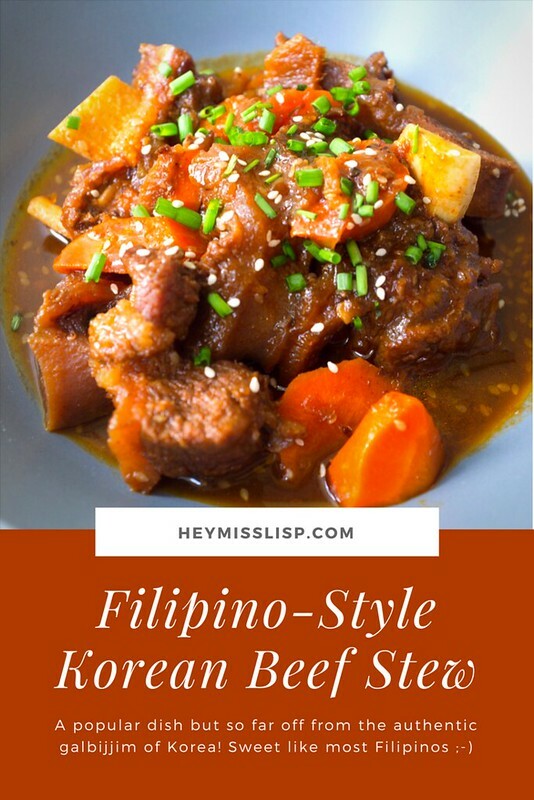 Apparently, this Korean beef stew version that most Filipinos came to know was from a highly popular food stall(?) called the House of Kimchi, way back when Korean food, K-pop and Korean dramas were unheard of in Manila. Because I have grown accustomed to Korean food, I can’t really go back to the ungodly sweet version, so this time around, I made my own version with my leftover 고추장 (go-chu-jang, red chili paste ) from when I made kimchi fried rice. It’s still not the authentic Korean beef stew, more like the spicy version of the Filipino-style one. I also added carrots as I’m now feeling guilty about making a dish without any vegetable. It added a different kind of sweetness to the stew, and made my version a little more orange. 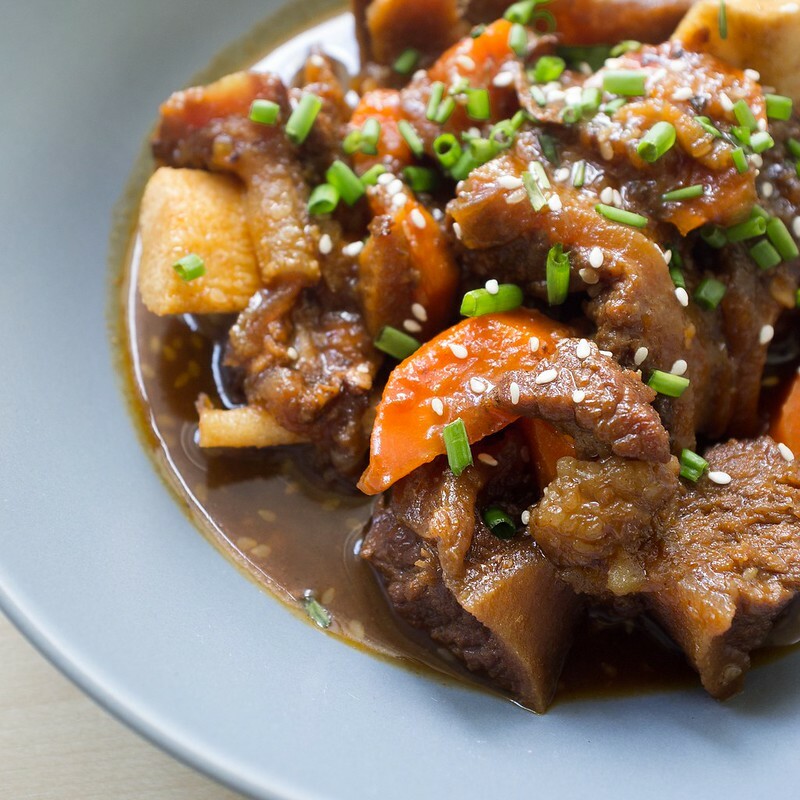 You’re welcome to skip the carrots if you want to enjoy the stew in its all-beef version. On medium heat, add cooking oil in a pot. Add beef short ribs and brown the meat on all sides. Add ginger, garlic, onions and fish sauce. Season with salt and pepper. Saute until fragrant. Add water, rice wine, sugar, soy sauce, and bay leaves. Bring to a boil, switch to low fire for a continuous slow simmer, removing scum. After about 1 hour, add 1 tsp sesame seeds and gochujang. Continue simmering until beef is tender (about another hour and a half), adding some more water if needed. Adjust sweetness and spiciness by adding brown sugar and/or gochujang, as preferred. Add carrots and simmer until fork-tender. Serve hot, garnished with spring onions, more sesame seeds, with a bowl of hot steamed rice. Don’t have rice wine? Skip it, don’t substitute regular white vinegar. Make ahead tip: As with most stews, this one will taste better tomorrow! 🙂 Store it in the fridge (with half cooked carrots, if you prefer) and reheat for an even more flavorful dish. You’re welcome. Hope you like it! Live Korean beef stew and am doing this as you inspired me.